Woods Resort in Almora earlier known as Pugs Paw Eco Retreat is a visual treat that lies plum in the heart of the Kumauni Himalayas 5200 feet above sea level. Once reached Woods Resort, you can endlessly keep exploring the various options - long treks as there are panoramic mountain trails over flowing with wild crimson rhododendrons. The calm & peaceful character of the resort is a heaven for meditation and yoga practitioners. 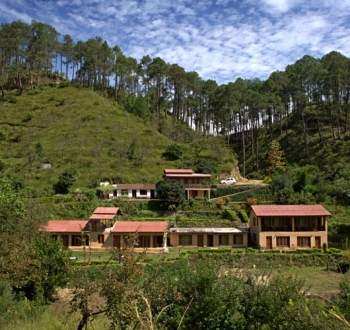 The resort nestled amidst dense forest of pine and oak surrounded by fruit orchards. You can endulge yourself in few nearby treks, watch mesmerizing sunrise, enjoy leisure walk along the river in and around the resort. Please note: There are no other hotel or resort around, you have complete peace and a unique offbeat experience for yourself. Woods Resort is strategically located in the middle of Kausani and Almora, admist the forest with hills on all sides. It offers you with some peaceful time, full of small pleasures in the midst of nature. Unlike other hotels that are located in the crowded Almora city, this Woods Resort is situated in a perfect offbeat place on the Almora-Kausani road near a village called Manaan. Almora is just 20 kms away from our resort and Kausani is 24 Kms. While staying here you can also visit: Binsar, Jageshwar, Ranikhet, Baijnath. 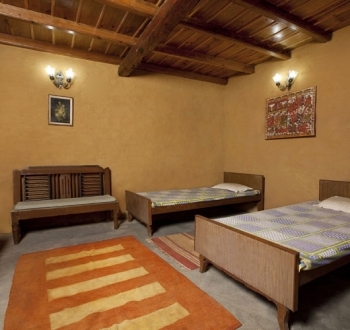 The rooms are built in a ‘Pahari’ style with charming decor, lovely view and nature as your only companion. The Pugs Paw Woods Resort Almora has 12 rooms, 2 suites and 2 meeting rooms with room service. All the rooms have basic amenities to make your stay comfortable. There is multi-cuisine restaurant and dining hall in Woods Resort Almora, that offers fine dining experience o guests by offering a lavish spread of authentic & traditional cuisines. - Accommodation for a couple in respective rooms according to their package selected. - Morning tea,American/Indian breakfast and and lunch/Dinner. - 15% Discount on additional food,beverages and laundry. - Souvenir gift at Departure. - All taxes included. No Service charge. - Packages extendable on Pro-rate basis subject to availability. By Air: Almora Woods Resort is 158 kms from the nearest airport at Pantnagar. By Rail: Kathgodam Railway Station is 126 Kms from the resort.